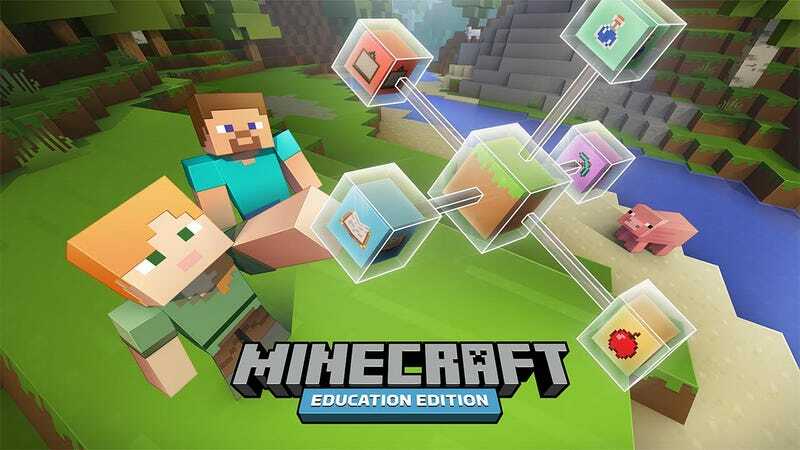 Launching this summer, Minecraft: Education Edition will be an “expanded” version of Minecraft for classrooms, distributed to educational institutions worldwide. Enhanced maps with coordinates for students and teachers to find their way around the Minecraft world together. Student Portfolio feature, where students can take photos and selfies to show their work and learning. Enhanced multiplayer, where a classroom of up to 40 students can work together toward a greater world in Minecraft. Login and personalization, where students have personalized avatars and feel more engaged in the game and teachers can know who each player is. World import and export, where teachers and students can create and save their worlds in the game. It’s multiplayer Minecraft with an educational twist, basically, where you can play together with your class on a Minecraft server and learn about (or teach) all kinds of subjects—as the FAQ puts it, “from math and physics to history and language arts.” Sounds more fun than the classes I’m used to, at least. Microsoft plans to launch Minecraft: Education Edition for schools, libraries, and museums this summer at a price of $5 per user per year.